I only recently discovered tofu and the many health benefits it offers. Tofu is a high-protein alternative to red meat. Due to its protein content, eating tofu can help you feel full while consuming fewer calories. A 1/2-cup serving of regular tofu provides about 10 grams of protein, according to the U.S. Department of Agriculture’s National Nutrient Database. Tofu is also a low-carb food. A 1/2-cup portion of regular tofu contains about 2 grams of carbohydrates. When trying to lose weight, trading in red meat and chicken for tofu is a great alternative. It takes on the flavors of whatever it is cooked with. Here is a yummy asian-inspired recipe. 2 tsp. ginger root, finely grated ( I use cubed ginger already grated and found at Trader Joe’s in the freezer section). 1 cup scallions (sliced into 2 inch pieces, This is about 1 bunch green onions. Keep white parts separate from green parts. Remove tofu from package and drain in a colander in the sink for a few minutes. Then cut tofu into slices about 3/4 – 1 inch thick. Put each slice between two paper towels and press down on it so most of the liquid is absorbed into the towel, then cut tofu into square cubes approximately 1/2-3/4 inch in size. Put wok or heavy frying pan on stove and preheat pan until it feels hot when you hold your hand over it. Add oil and heat until shimmering. 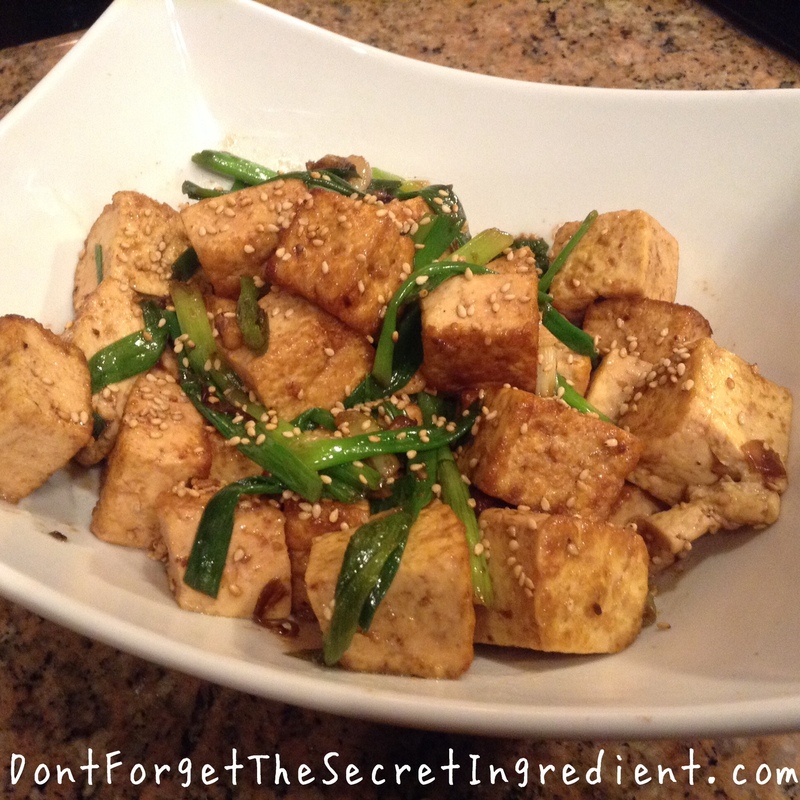 Then add garlic and ginger, cook about 10 seconds, and quickly add tofu cubes and white pieces of green onion. Cook, stirring occasionally, until the tofu is nicely browned. (I cook it about 7 minutes or more). When tofu is well browned, add the stock and cook, stirring, until it is mostly evaporated. Add the green parts of green onions and cook about 30 seconds. Add soy sauce and stir to distribute. Turn off heat, put tofu and onions on a serving plate and sprinkle with sesame seeds. (The sesame seeds will be more flavorful if you toast them for 1-2 minutes in a dry pan, but it’s not essential.) Serve hot. Note: I recommend doubling the recipe as there are never any leftovers and my family always wishes there was more. I found this easy, healthy and flavorful recipe from Yummy.com at Kalyn’s Kitchen.